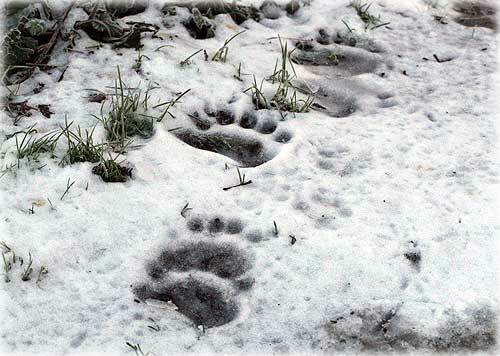 Bear prints in the snow, Dec 5 at Herring Cove. 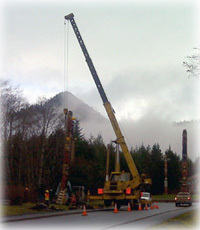 Saxman: Restoration Stabilizes Totem Poles - The Giant Oyster Pole and the Two Frogs Pole in Saxman, Alaska were experiencing significant decay along their bases due to the bare wood of the poles being placed directly into the ground when the poles were installed in the Saxman Totem park over 70 years ago. To address the issue, Saxman received Commercial Passenger Vessel Tax funding to stabilize the poles. Ernie Hamilton of Three Dog Construction helps to stabilize Saxman’s Giant Oyster Pole, ensuring its safety for years to come. Ketchikan: Ketchikan Community Concert Band Festive Holiday Concert - The Ketchikan Community Concert Band will present a festive holiday concert on Sunday, December 12 at 3:00 pm at the Ketchikan High School Auditorium. The performers will open their holiday concert with "Alaska's Flag", and continue with "Christmas Sketches", a unique arrangement by Sean O'Loughlin. Following is a suite for concert band entitled "Chesapeake" "inspired by the bountiful Chesapeake Bay and dedicated to all who live, work and find recreation on America's waterways". Ketchikan: Practice safety with holiday decorations - As the holiday season approaches, there is an increased excitement about adorning our homes with the traditional decorations of Christmas trees, ornament, and garlands. Holiday decorations, as beautiful as they are, can also be an added home fire hazard. Statistics provided by the National Fire Protection Association reveal that a candle fire in the home is reported to a fire department every 30 minutes and each year nationally, fire departments respond to roughly 260 structure fires caused by Christmas trees. Alaska: State Works to Remove Aggressive Wolves Near Port Heiden - Residents of Port Heiden on the Alaska Peninsula have asked the Alaska Department of Public Safety and the Alaska Department of Fish and Game (ADF&G) for help with aggressive wolves that have been killing pets and approaching people in frequent visits to the community. Residents report that wolf numbers, attacks on domestic animals, and threatening behavior toward people is increasing. Wolves have killed 5 dogs and 2 cats this year, including 2 dogs during the last few days. Villagers have killed 6 wolves in the vicinity of the village since August. Currently there is not enough snow on the ground and local waterways have not frozen enough to allow local residents to safely travel by snow-machine, which hampers their efforts to take wolves. Alaska: NOAA PROPOSES LISTING RINGED AND BEARDED SEALS AS THREATENED UNDER ENDANGERED SPECIES ACT - NOAA’s Fisheries Service is proposing to list four subspecies of ringed seals, found in the Arctic Basin and the North Atlantic, and two distinct population segments of bearded seals in the Pacific Ocean, as threatened under the Endangered Species Act. The proposed listings cite threats posed by diminishing sea ice, and additionally, for ringed seals, reduced snow cover. NOAA climate models were used to predict future sea ice conditions. Dave Kiffer: A Brit Bid to Bridge the Gravina Gap? - Several of my loyal readers (it surprised me too that there were more than two!) have contacted me let me know that the British navy has an aircraft carrier for sale. Yes, you - for a minimum bid of $5 million pounds ($7,837.334.41!) can win - at auction, the HMS Invincible. Call now and they will throw in a couple of harrier jump jets just for the heck of it. If you are wondering why I would care - or more appropriately why other folks would know that I care - then you just haven't been paying attention! I think that an aircraft carrier would solve a variety of Ketchikan's ills. Unfortunately, not the HMS Invincible. More on that in a moment. It all goes back to a couple of bored journalists in the early 1990s. My late, great friend Pete Figueroa was probably the only person to work for every media outlet in the city of Ketchikan, at least twice! He specialized in attending governmental meetings, two or three times a week, depending on whether he was doing print or broadcast journalism. He knew a lot about what was going on in town because he paid attention. He also had really active brain! One night, he and I were sitting through a lengthy and pointless school board meeting (yes, I realize that pointless and lengthy are redundant when combined with school board meeting). This was in the early 1990s when the idea of bridge to the airport on Gravina was burbling back up into the community consciousness as it is wont to do every 10 years or so. So we were sitting there listing to the school superintendent drone on about the latest Blue Ribbon Panel Initiative to boost Vitamin D in school lunches. Pete scribbled something on a piece of paper and passed it to me. Silly me, I was actually paying attention to the inane speech, so I shot him a quizzical look.